Two summers ago I gave myself an impossible mission, "Teach my Dad how to blog." It was really a challenge since my Dad didn't want to go online and teaching him to SMS was hard enough. Eventually he gave me permission to set-up his blog. He wasn't keen on having one, but I was so makulit! Now, it's Miguel who does the blogging for him hehe. Well, the mission to get him in front on a PC is still a mission to this day. 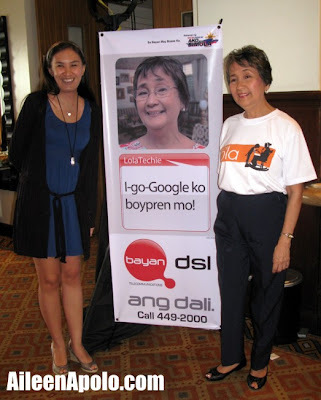 When the "Lola Techie" ads came out I started bugging my Mom to learn how to go online. She just told me, "Wala ako computer eh." I know it would be easier to teach my Mom since I taught her how to use MS Word before. Good thing my Ate sent our Mom some money to buy a new PC. So we got it this afternoon and I installed some basic apps. The first thing I taught her was how to watch videos on Youtube! LOL. Anyway, Bayan launched an advocacy program, "Teach Lola the Internet." They found out in an informal poll that 81% of Filipinos are still close to their grandparents, 57% of which still visit from time to time, but 87% still want to communicate with their grandparents. Lola Techie said that teaching your lola (or lolo) to use the internet would be very helpful in bridging the digital divide. I agree with Lola Techie and I'm now skimming through the Teach Lola website for some tips on how to teach my Mom. Hopefully when my Mom's really knowledgeable already she'll be able to convince Dad to finally take the plunge. Wow Lola Techie is really active now. I think this campaign will really encourage the elderly to use the Internet more and catch up with what's going on. @Janette Toral I hope so too! I hate the patronizing way Lola Techie portrays grandmothers as busybodies. My grandmother died while doing her job, not googling my girlfriends. ang galing! i sooo love lola techie! great project by bayan tel! @Mike to each his own. @Maui hopefully! And it's really hard to teach. I Will Be Forever 25!